Published in: Nizamuddin, M. (1987). 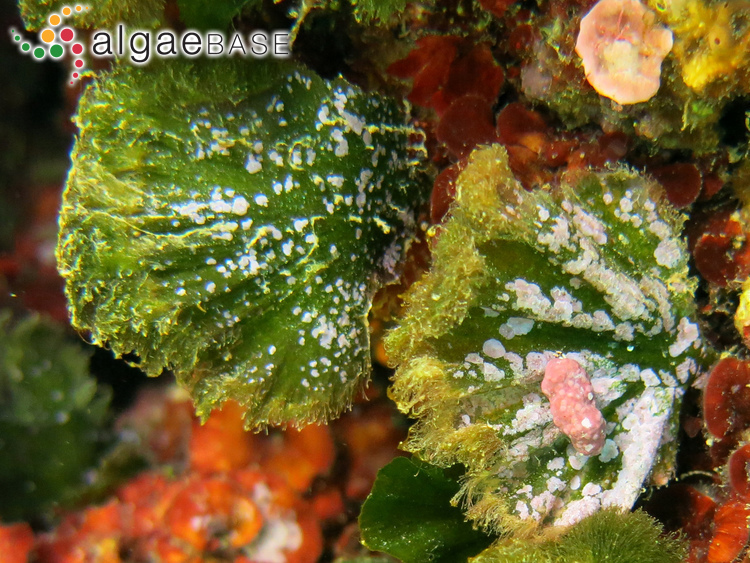 Observations on the genus Flabellia (Caulerpales, Chlorophyta). Nova Hedwigia 44: 175-188, 21 figs. The type species (holotype) of the genus Flabellia is Conferva flabelliformis Desfontaines. John et al. 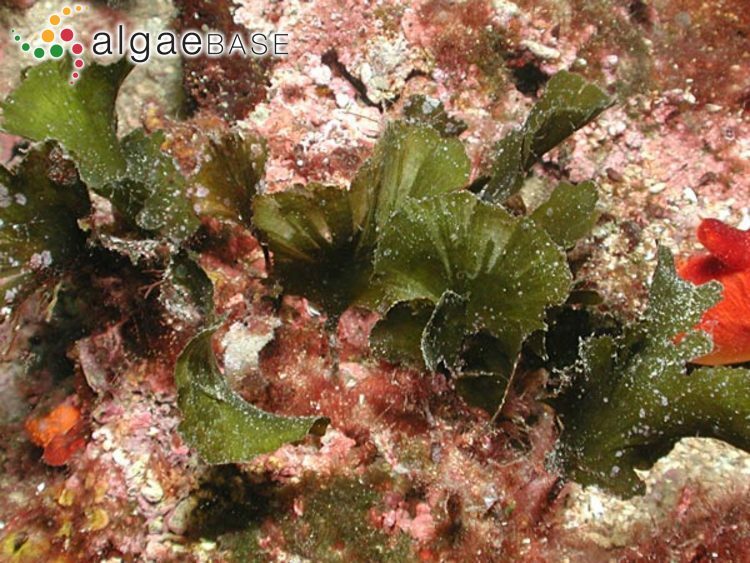 (2004) cite Flabellaria petiolata (Turra) Trev. and Udotea minima Ernst as synonyms of this species. Europe: Balearic Islands (Rodríguez y Femenías 1889, Buen 1905). Europe: Greece (Gerloff & Geissler 1974, Haritonidis & Tsekos 1976), Italy (Giaccone 1969). Africa: Sudan (Papenfuss 1968 ). South-west Asia: Israel (Einav & Israel 2008). Europe: Adriatic Sea (Giaccone 1978, Munda 1979, Ercegovic 1980), Balearic Islands (Rodríguez y Femenías 1889, Navarro & Bellón 1945, Dao 1957, Gómez Garreta 1983, Ribera Siguán 1983, Ribera Siguán & Gómez Garreta 1985), Corsica (Boudouresque & Perret 1977, Coppejans 1979, Demoulin, Janssen & Licot 1980, Verlaque 1984, Rodríguez Prieto, Boudouresque & Marcot-Coqueugniot 1993), France (Feldmann 1937, Augier, Boudouresque & Laborel 1971, Coppejans 1972), Greece (Diannelidis 1953, Gerloff & Geissler 1974, Haritonidis & Tsekos 1976, Tsekos & Haritonidis 1977, Diapoulis, Haritonidis & Koussouris 1986, Athanasiadis 1987), Italy (Giaccone 1969, Cinelli 1971, Feoli & Bressan 1972, Edwards et al. 1975, Cinelli et al. 1976), Malta (Price 1970), Spain (Seoane-Camba 1965, Ballesteros 1981, Romero Martinengo & Romero Martinengo 1982, Barcelo & Seoane 1982, Boisset & Barceló 1984, Pérez-Ruzafa & Honrubia 1984, Gallardo et al. 1985, Rodriguez Prieto & Polo Alberti 1988, Soto & Conde 1989, Pérez-Ruzafa et al. 1991), Turkey (Europe) (Güven & Öztig 1971, Güner, Aysel, Sukatar & Öztürk 1985, Cirik, Zeybeck, Aysel & Cirik 1990, Zeybek, Güner & Aysel 1993). Atlantic Islands: Canary Islands (Børgesen 1925, Gil-Rodríguez & Afonso-Carrillo 1980). Africa: Egypt (Aleem 1993), Tunisia (Meñez & Mathieson 1981, Ben Maiz, Boudouresque & Quahchi 1987). South-west Asia: Israel (Nemlich & Danin 1964, Einav & Israel 2008), Lebanon (Lakkis 2013). Europe: Adriatic Sea (Gallardo et al. 1993, Curiel et al. 2012), Apulia (Bottalico et al. 2016), Balearic Islands (Gallardo et al. 1993, Ribera, Coloreu, Rodriguez Prieto & Ballesteros 1997, Joher et al. 2012), Corsica (Gallardo et al. 1993, Sales & Ballesteros 2010), France (Gallardo et al. 1993, Anon. 2017), Greece (Gallardo et al. 1993, Tsirika & Haritonidis 2005, Tsiamis et al. ), Italy (Gallardo et al. 1993, Gallardo et al. 1993, Cecere et al. 1996, Furnari, Cormaci & Serio 1999, Rindi, Sartoni & Cinelli 2002, Kooistra 2002, Serio et al 2006), Malta (Cormaci et al. 1997), Sicily (Alongi et al. 2012), Slovenia (Kooistra 2002), Spain (Gallardo et al. 1993, Flores-Moya et al. 1995, Pérez-Ruzafa et al. 2008, de los Santos, Pérez-Lloréns & Vergara 2009, Mercado et al. 2009), Spain (incl. Canary Is.) (Gallardo et al. 2016), Turkey (Europe) (Gallardo et al. 1993, Taskin et al. 2008 ), Veneto (Sfriso 2011, Sfriso 2011). Atlantic Islands: Canary Islands (Haroun et al. 2002, Gil-Rodríguez et al. 2003, John et al. 2004, Anon. 2011, Afonso-Carrillo 2014), Cape Verde Islands (John et al. 2004, Prud'homme van Reine, Haroun & Kostermans 2005). Africa: Algeria (Gallardo et al. 1993), Egypt (Gallardo et al. 1993), Egypt (Mediterranean) (Shabaka 2018), Libya (Gallardo et al. 1993), Morocco (Gallardo et al. 1993, Benhissoune, Boudouresque & Verlaque 2001, Benhissoune, Boudouresque & Verlaque 2001), Sudan (Osman & Mohammed 2016), Tunisia (Gallardo et al. 1993, Verlaque et al. 2017). South-west Asia: Cyprus (Taskin et al. 2013, Tsiamis et al. 2014), Israel (Hoffman 2004, Einav 2007, Einav & Israel 2008), Levant states (Gallardo et al. 1993), Turkey (Asia) (Taskin et al. 2008 ). Pacific Islands: Central Polynesia (Tsuda & Walsh 2013). Nizamuddin, M. (1991). The green marine algae of Libya. pp. 1-230. Bern: El-Faateh University, Department of Botany. Silva, P.C. (1955). The dichotomous species of Codium in Britain. Journal of the Marine Biological Association of the United Kingdom 34: 565-577, 5 figs, 1 plate. Accesses: This record has been accessed by users 4537 times since it was created.